Tossing and turning of grass to dry it out is called 'tedding'. As organic farmers we make great efforts to manage our soil. We treat the soil as a living thing, whereas conventional farmers treat it as a dead thing. Soil is, essentially, the ecological base for much over-ground life. Because we manage our soil organically, we should have higher levels of earthworms and therefore the nutrient supply to crops should be higher. Burwash Manor Farm sits up to 180 feet above sea level. 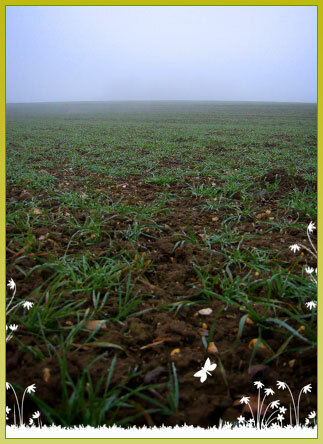 Most of our soil is heavy boulder clay, or sandy clayloam and we also have small areas of chalk loam that is rich in nutrients and retains mositure well in a dry year - this allows for intensive arable cropping of good grass growth. As with most of the UK the prevailing wind is South Westerly. Our average rainfall varies between 20 inches p.a. and over 30 inches p.a. (and some years most of it seems to fall in July and August! ).